In this high-powered world of instant coffee, meetings about meetings and Instagram accounts dedicated to pets, things can pretty rapidly become overwhelming. Thanks to the Apple Watch, though, we're constantly being reminded to take a deep inhale and relax. Introduced alongside the original version of the smartwatch back in 2014, the Breathe app has been popping up and telling wearers to take moments out of their day to centre themselves and focus on their, well, breathing. If you're an Apple Watch beginner, though, it may be one of the areas you need a couple of pointers on. 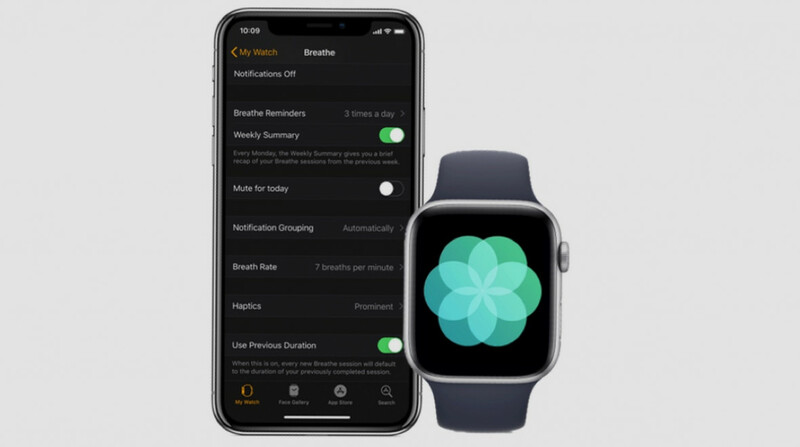 Luckily for you, we've detailed everything you need to know below, so read on for instructions on how to use the Apple Watch's Breathe app. There's no download needed here, since 'Breathe' is already built into the Apple Watch out of the box. All you need to do to get started is to head on over to the honeycomb menu and select it from the group of apps. For even quicker access, you can even set it up as an Apple Watch face complication. The actual process of Breathe is very straightforward – you essentially just follow along with the graphic on the watch face and the haptic feedback on your wrist. To get started, just twist the Digital Crown to your desired session length and hit Start. You'll be reminded to stay still, in order to gain a good reading, to inhale when the animation grows and exhale when it shrinks. Once you're all done, the watch will vibrate a couple of times and then chime (unless you have silent mode on), with a heart rate figure also shown. A couple of things to note, though. The Apple Watch will mute some notifications when you're in a session, but if you answer a call or you're deemed to be moving too much, things will just end and you won't get the credit you deserve for breathing. Maybe you want to breathe more, maybe you want to breathe less (hopefully not too much less) – either way, you can adjust your reminders and also the nature of the sessions you take. If you want to adjust the duration of your session, as we said, this can be done through the Digital Crown. However, if you want to set a different default option, head to the Apple Watch app on your iPhone and head to the My Watch tab. From there, tap 'Breathe' and scroll down to 'Use Previous Duration'. Changing the length of each breath is also possible, and great if you find the default a bit too hard to stay in sync with. Again, from the My Watch tab in the Apple Watch app, go to Breathe > Breathe Rate and then adjust to your desired breaths per minute. The reminders your Watch gives you can be changed, too. Simply go to the Breathe section of the My Watch tab and tap 'Breathe Reminders'. It's from here you'll be able to turn on/off notifications, mute them just for the day, give yourself five reminders a day or toggle the option to send them to the Notification Center. Wondering why your Breathe reminder is popping up at a different time? Well, if you're moving or in the middle of exercise when you'd typically receive one, or if you've manually begun a session, the Apple Watch will reschedule it. Though Breathe can be used to give you a daily jolt of focus, you may often not find a couple of minutes in your day to follow along with the app. That's why it's a neat idea to just check in with how often you've been using the app. On the Watch itself, you're only shown how many times that day you've used the app, but you can delve deeper through the Apple Health app. Once you've opened things up on the iPhone, jump over to the Health Data tab, forward onto Mindfulness and then tap the graph to reveal the details. It's simple stuff, but you do get an indicator of just when you've been taking sessions and for how many minutes in a given day, week, month or year you've been using Breathe.